The summer that Noah was two, Mike and Noah were the same. When I say that, I mean that they were entertained by many of the same things and had a similar level of skills. Noah was much more verbal than Mike. At the age of two he had well over 200 words while Mike’s language had vanished almost completely. 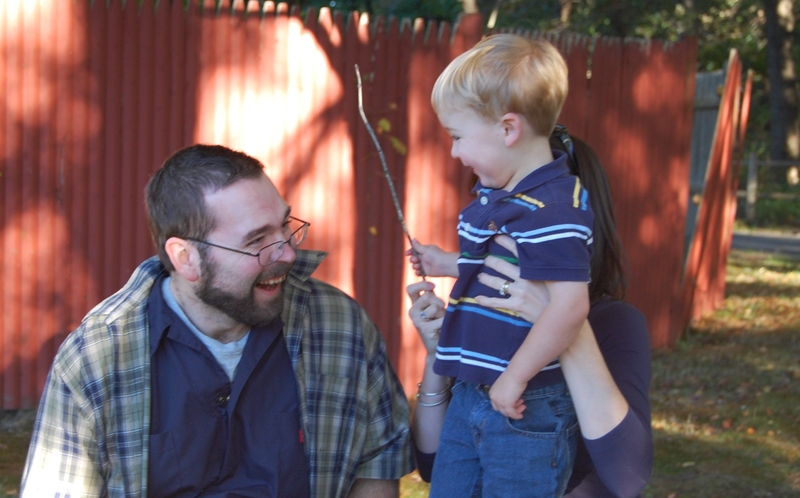 But, Mike smiled and laughed a lot and it was easy to coax a joyful noise out of him, especially when Noah was around. 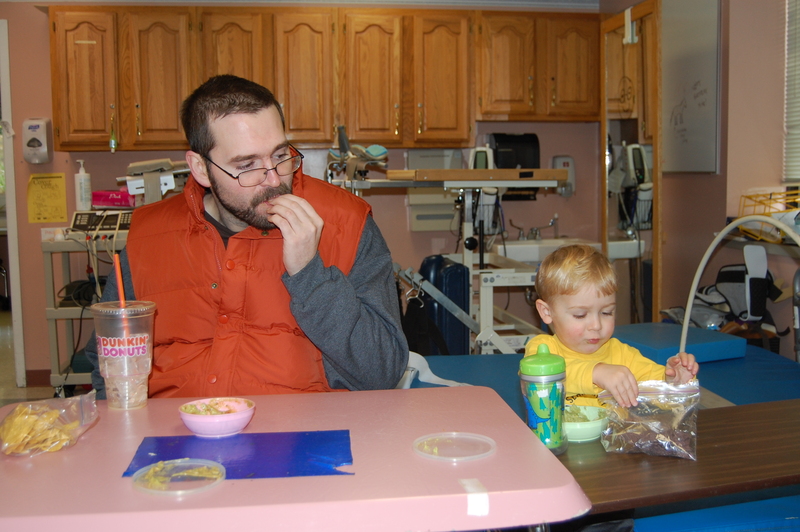 Mike moved into the neuro-rehabilitation center in the spring of 2010, and when the case manager asked me what one of my goals was for Mike, I answered immediately “family time.” An occupational therapist was assigned to Mike to help with family visits. Due to Mike’s erratic behavior, inability to communicate or follow verbal directions paired with Noah’s wild toddler energy, it was essential that I had another adult present during visits. I would arrive with Noah and wait in the hall outside of Mike’s locked unit door until he appeared with his aid or occupational therapist. By this time, Noah would be yelling to get out of his stroller or running in circles to try to make a break for it down the hall. I would entice both of them with a snack to lead them into the enclosed outdoor courtyard. Our routine was set: a short activity, a snack and a photo. We would bring bubbles, hula hoops or balls to try to engage Mike and Noah in simple play. Sometimes we would just take a walk. Mike and Noah had to have the same snack or Mike would want to take what Noah had and vice versa. It sounds organized, but it didn’t feel that way. I often felt like I was in some kind of a bizarre version of a ping pong game in that courtyard. Mike would pace quickly in circles on the brick path while Noah ran back and forth, relentlessly pushing the handicap button to open the door leading out of the courtyard. Noah would climb in the mulch and in the bushes and plants to pop out and scream “Boo!” at Mike. This always made him laugh and Noah would erupt in fits of giggles, usually leading to hiccups, because he had gotten such a big reaction out of Daddy. I didn’t worry about time, a 15 minute visit one day could be a 40 minute visit the next, instead I looked for special moments. Sometimes Noah would run after Mike while he was circling the courtyard and reach up and grab his hand. They would walk together like that, not talking, just together for a lap or two and then Noah would go back to playing hide and seek in the shrubbery. One time, Mike was sitting and drinking ice coffee on a bench watching Noah play with a stick. Noah brought the stick over to Mike and promptly whacked him on the head with it. I was horrified and about to reprimand Noah for hitting Daddy when Mike burst out in the biggest belly laugh, making eye contact with an impish Noah. It was so clear that they were sharing a joyful moment, I had to let it go (and remove the stick). As summer turned into fall, I started to notice some changes. Noah and Mike shared a love of a favorite snack, tortilla chips and guacamole, and as Noah was mastering scooping the mounds of avocado onto the chip before popping it into his mouth, Mike was losing that ability. Noah was becoming interested in potty training and I was having conversations with staff about Mike needing to wear adult diapers at night and even during the day. Noah was a sturdy, steady runner and we were beginning to worry about Mike’s balance and his risk for falls increased. That was a turning point. I realized that a new decision was looming. A new mile marker in the FTD journey would soon be upon us. How many more visits would my son have with his father? I felt an overwhelming urge to protect Noah. I knew that his memories of Mike would be limited and I didn’t want them to be negative or scary. I didn’t want him to remember a dad who was sick. I thought I might rather he not have any memories at all if they were all going to be sad ones. And, just as fiercely, I wanted to protect Mike. He had wanted to be a dad for so long and he loved Noah so completely. I wanted to protect Mike’s position as Noah’s father and try to preserve some positive feelings between the two of them. This decision is an example of a moment of isolation in my caregiving experience. None of the other moms in my “Mommy & Me” classes were grappling with this issue. I felt judged for bringing Noah into the neuro rehab center, and equally judged for thinking about keeping him out. I was selective about who I would share these concerns with, being unsure of my own decisions. Wondering if I would ever make the “right” one. Visits were stretched out across days and weeks and a dual birthday party was planned for that March. Noah would be 3, Mike 32. We had ice cream cake and presents. There were balloons and streamers. A photographer who I had met through the FTD support group donated her time to take family pictures of us. It felt like the end of something. A celebration that was a goodbye. But I wasn’t sure. Six weeks after the dual birthday party, Mike was in a wheelchair. He had lost the ability to walk on his own. Falling frequently and unable to engage in the motor planning necessary to transition from sitting to standing, he was safer strapped into a chair. I didn’t want Noah to see him that way. The visits slowed even more. Until the 4th of July. Earlier that week, when I was driving with Noah in the car he said to me “I just want to say hi to Daddy.” It seemed like a request that I couldn’t deny. So, I made a plan with Mike’s favorite aid to have Mike sitting at a courtyard table with her when Noah arrived. The wheelchair stayed hidden in the hallway. I brought ice cream from Friendly’s. Noah fed himself while the aid fed Mike. Noah ran around the courtyard and I could see Mike watching him. Noah sang songs for our applause and laughed when I bestowed butterfly kisses with my eyelashes upon Mike’s cheeks. We took a family photo. Noah and I walked out of the courtyard. Mike stayed seated. Noah blew him kisses with his chubby 3 year old hand and yelled a quick “Bye Daddy! Love you!” As we walked down the hall to the exit, I knew it was the last visit. I felt sure. I just didn’t know if I felt right. After not seeing Mike for 9 months, Noah had a positive memory of his father. Thinking of him laughing. Laughing in heaven. That moment was a gift for me. A gift for Mike. To know that locked inside our son’s heart there was a memory of joy and happiness gave me hope. Hope that Noah could grow with memories he would want to keep and re-live. Hope that I had protected his heart and his father’s dignity. Hope that I had made the right choice. Going for it! 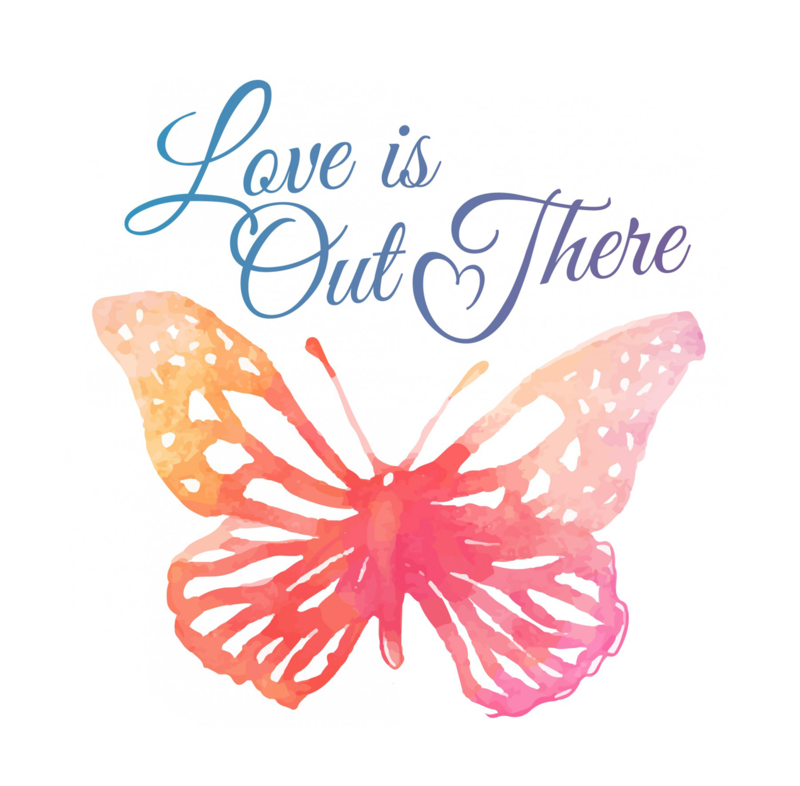 …because love is out there.